The leather Oxford Chesterfield Sofa is a classic. Sure to bring sophistication and comfort to your room, this sofa comes hand crafted in a specially developed hand finished vintage leather to recreate an antique look. 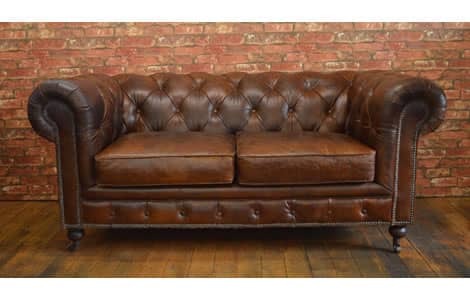 The Oxford Chesterfield Sofa is only available in one aged hand finished Vintage Conker leather. This beautiful 2 Seat Sofa is ready made and available for dispatch at the earliest opportunity.